Mack Trucks salutes the dozens of drivers who participated in the 2018 National Truck Driving Championships as well as the hard work and dedication of the 3.5 million professional truck drivers across the industry for National Truck Driver Appreciation Week, which ran from Sept. 9 to 15. Mack Trucks salutes the dozens of drivers who participated in this year's recent National Truck Driving Championships (NTDC) in Columbus, Ohio, as well as all professional drivers who keep our economy moving. 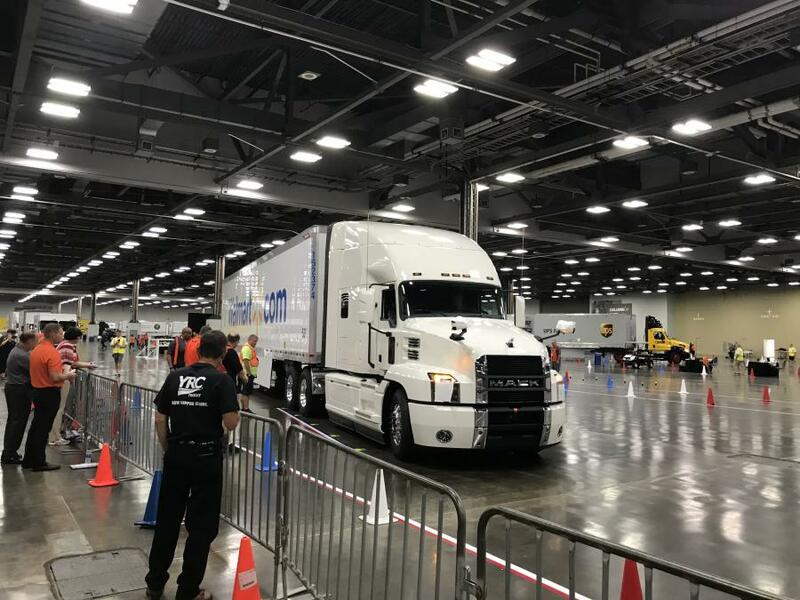 Showcasing the talents of professional truck drivers from around the country, participants competed in nine vehicle classes that tested driving skill, safety and acumen. At the conclusion of the event, Scott Woodrome of FedEx Freight was named Grand Champion. "On behalf of everyone at Mack Trucks, we offer our congratulations to Scott and all of the National Championship-winning drivers," said John Walsh, Mack vice president of marketing. "These champions have demonstrated incredible skill and precision not only in driving, but also in knowledge of the trucking industry." This year, several competitors drove an all-new Mack Anthem in the contest. Mack provided two white Mack Anthem 70-inch standup sleeper models, while Mack customers Pitt Ohio and ABF sent two Mack Anthem day cab models and two Mack Pinnacle 4x2 axle back models respectively. The American Trucking Associations' Share the Road Mack Anthem, which is used to educate the public about the trucking industry and how to safely share the road with trucks, also was on display throughout the event. Combining a bold, aerodynamic exterior design with the all-day comfort of an interior designed with driver input, the Mack Anthem is the truck of choice for drivers seeking to improve efficiency and productivity. In addition to recognizing the NTDC champions, Mack thanks the 3.5 million professional truck drivers in the industry during National Truck Driver Appreciation Week, which runs from Sept. 9 to 15. "Professional truck drivers play such a crucial role in our economy, helping ensure the timely delivery of important goods," Walsh said. "Even in the face of long hours spent away from home, these hard-working folks get the job done, and for that we say ‘thank you!'" Professional drivers and the important roles they play have been highlighted throughout the year through RoadLife, Mack's series of docu-style films. The films share the experiences of drivers whose stories aren't often told, despite the importance of their work to maintaining our society. To catch up on the RoadLife series, visit roadlife.tv or Amazon Prime Video.